Flat concrete surfaces are used to tame soil inconsistencies and provide a mechanically sound base. That principle rules the laying of our most stable foundations, but we need more than a hardened building material to properly execute this task. This is where reinforced metal meshes come into play. These metal cages strengthen the concrete and act as a kind of skeleton. But what’s the role of slab-on-ground plastic bar chairs in this supporting mesh? If we had access to a virtual x-ray, we could reveal the reinforced strength behind our finest concrete surfaces. Alloy-reinforced rods are running through the material to form a cage inside the concrete. It’s thanks to this metallic hard center that the foundations of the structure are imbued with iron-toughened strength. Slab-on-ground plastic chairs are essential aids in this hidden scaffolding, yet they’re not designed to be part of this supporting network of reinforced metal, which is why a plastic construct is more than enough for this purpose. Rather, they act as the mechanism that imbues the mesh with its floating attributes, so a stable but strong profile is favoured. Primitive variants are still in use on modern construction sites. These are the blocks of concrete with pairs of cable ties. They’re spacers and ground supports, but their functional aptitude is relatively unimpressive. High-end plastic variants have cutouts and wide, flat bases. They’re also available in a number of sizes, so graded concrete surfaces aren’t a problem. The slab-on-ground assets are the ideal utilitarian fixtures for car park concrete surfaces, sidewalks, building foundations, swimming pools, and many other graded concrete-to-ground applications where the metal bars of the reinforced metal grid must be properly leveled and supported. A stout outline of strategically placed bar chairs acts as an interface between inconsistently graded soil and the precisely locked reinforcing cage, so the added clearance translates to stability, a leveling asset that’s made possible by a toughened material design. Therefore, the bar chairs must be fabricated to meet exacting dimensional requirements and stringent material standards. The latter requirement calls for a plastic that’s weatherproof and immune to the acids and alkaline that affect the soil. 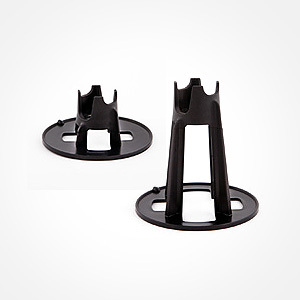 These plastic positional aids are built with quality in mind. They’re also available in different heights, so graded foundations are a part of their engineered build. In conclusion, the seemingly floating rods and metal-reinforced rods form a static cage, one that’s ably held in place by these specialized mounts.